Ramadan is one of the most awaited months of the Islamic calendar. This holy month is full of blessings and mercy that Allah Almighty showers on Muslims. Companions of Prophet Muhammad (SAW) start preparing before the arrival of this holy month. We should also try to prepare ourselves for the start of the month of Ramadan. As we all know that fasting is more than just abstaining from food but from indecent speech and lustful desires as well. Fasting pushes us to be conscious of our actions. There is so much importance of Ramadan in the life of Muslims as discussed in many Ayahs of Holy Quran and Hadiths of Prophet Muhammad (SAW). For general understanding, the Ayah of Quran that stresses the importance of Ramadan has mentioned below: “O you who believe! Observing al-sawm (the fasting) is prescribed for you as it was prescribed for those before you, that you may become al-Muttaqoon (the pious)” (Quran, 2:183). It is clear from this Ayah of Holy Quran that fasting is nothing new or special that was bestowed upon Muslims, rather the earlier nations of the earlier Prophets also kept fast. Fasting is of grave importance for Muslims as it helps them purify their souls and transform to a higher level of piety. 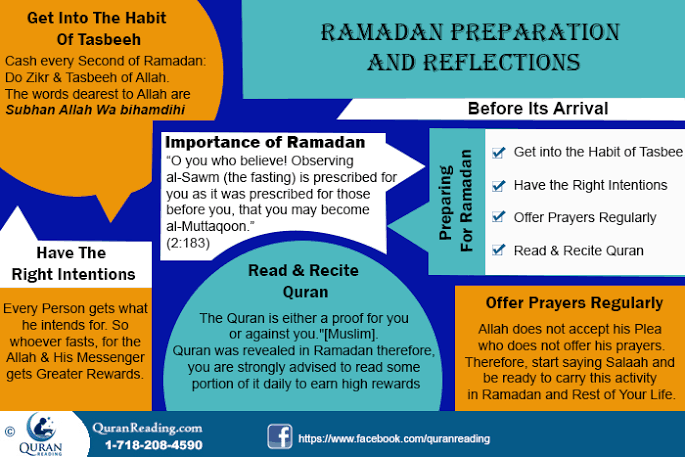 Here are some ways to prepare for Ramadan before its arrival so we can take full benefit from this holy month. Fast Voluntarily before Ramadan: Fast before Ramadan will help you get used to the routine of fasting so that during Ramadan. In order to gain control over your actions, stomach and desires also you can adjust and synchronize better. Create Ramadan Countdown: Ramadan countdown will help to create hype buzz in our mind and among all others who are around us. This will lead to regular conversation and a source of excitement spread related to Ramadan. The practice of Reciting Noble Quran: If you have not been a regular reader of the Holy Quran, this is an ideal time to start, and make a habit out of it, so that you can progress faster in Ramadan. Start now to recite Quran and reflect upon it so that you can get closer to Allah Almighty. Make the Right Intention: Make an intention that this Ramadan will be a time of great spiritual effort and sincerity. To help turn that intention into reality, make checklists of both daily goals for Ramadan and goals for the overall month before its start. Perform Extra Prayers: If you have no missed obligatory prayers to make up, start to pray voluntary Sunnah prayers to prepare yourself for the extra prayers that take place in Ramadan. If you do have missed obligatory prayers, use the time you would give to the Sunnah prayers to make some of them up. Get into the Habit of Tasbeeh: Tasbeeh is a verbal praise of Allah Almighty which a Muslim does by either reading phrases or words of praise of Allah Almighty. In Ramadan, each and every moment gets sanctified; therefore, to get the maximum reward from the days of Ramadan besides regular prayer a Muslim must do Tasbeeh as well. Eat Healthy and Moderately: With less time to eat in Ramadan, we really need to pay attention to what we eat. Now is the best time to research the nutritious value of the food we eat. While we fast, the food we eat before we start our fast or to break our fast needs to provide the optimal energy so we can accomplish our daily tasks and increase our worship. Repent and seek Forgiveness: Start repenting and seeking forgiveness from Allah Almighty for all wrongdoings before the start of Ramadan.